So it’s about time for a new blog. Like in the old days when I was doing my Las Vegas blogging, get some popcorn and coke, this is going to be a long one! After writing my blog on Saturday I watched some episodes of Entourage S3 and jumped behind my computer at 15:30. I downloaded TableNinja and was up for a test. This software should help you multitable, although I can handle playing 24 tables fine with using a mouse. I was hoping TableNinja would make it even more easy and might also help a bit in preventing RSI. I fired up about 10 tables and as you might have already picked up, I didn’t like it at all. It sometimes performed actions where I didn’t even press a hotkey yet, autojoining tables isn’t a help because sometimes it’s really useful to do seat selection and having my timebank getting automatically clicked works fine, but I never need my timebank unless I’m using TableNinja. So I switched off TableNinja after about 30minutes and since a lot of tables fired up I kept playing. I was hoping for some nice profit as it was Saturday so there should be enough bad players around. Well that didn’t work out as well, I couldn’t win at all, quit at 22:15 on the day low after 8.327 hands, -$1.990 and 6.762 VPP, ouch! I quit the session because I was finally going to see Avatar in IMAX 3D. I was expecting a nice movie but I wasn’t only nice, I really loved it. It was a spectacular 162 minute ride where I didn’t get bored a single minute and loved the 3D affects. This is something you have to see in the cinema’s, so if you didn’t have time yet to see it, make time! So Sunday it was time for some more chilling on the couch, which means more Entourage S3. At 18:00 I made myself a little dinner and started my session at 18:30. Since TableNinja really should be a big help, I gave it one more try. I was playing about 16/18 tables and did fine, but every time things got busy (lot’s of action), I seem to lose it. I couldn’t focus, I just couldn’t click the right hotkeys but even more important, I needed my timebank at about every table. TableNinja should make you play faster, not slower! I’ve played over 1M hands with a mouse, often playing 20-24 tables and I’ve got a routine working which is really hard to change I guess. After losing $600 I killed TableNinja for good. So after I quit TableNinja the amount of $10/$20 and $15/$30 tables was getting crazy! I think at one time there where about 10 of them opened and all the other tables where $5/$10. I never racked up so many VPPs/Hour, I think I was far over making 1100/Hour. Besides making a lot of VPPs, I was doing very good on the tables as well. 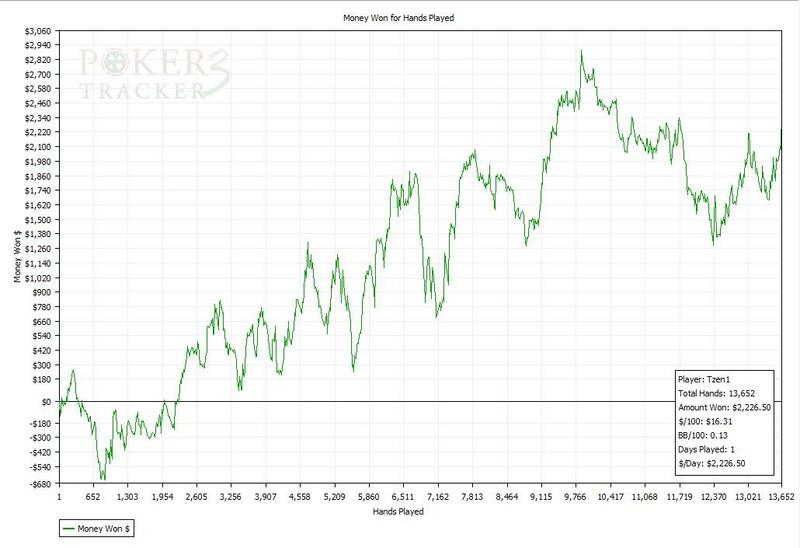 After 7.646 hands I was up $1.958,50 and took a small break to watch another episode of Entourage and to get some food in. The second session was a nice and swingy one, where I was down $700, up $1000, again down $700 and finishing at +$268,50 at 05:35. I played a total of 13.652 hands, winning +$2.226,50 which is my best day ever! and getting almost 13K VPPs! which also is the most VPPs If ever made in one day. So yesterday was my last session before I have to work again tomorrow. Tonight I will be going to the gym for the first time this year, as I skipped it yesterday and I don’t want to slack on the gym already! 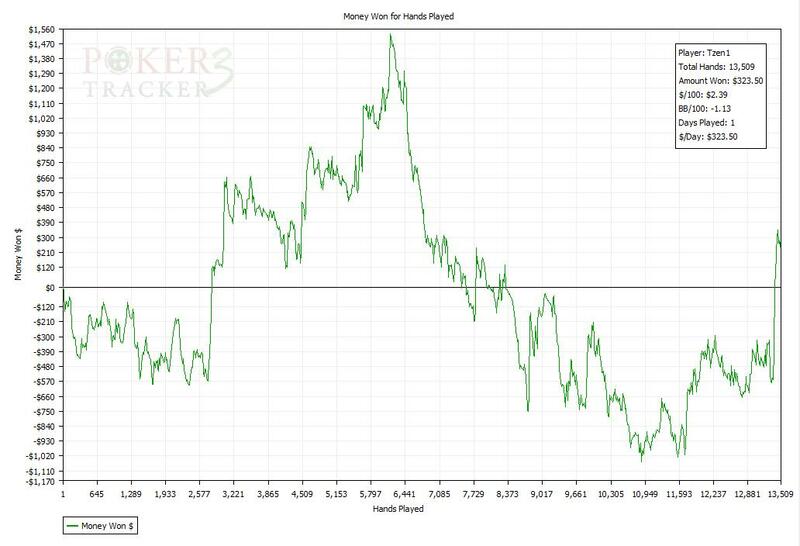 I fired up my tables and was listening to some nice music and got a really good flow going after being down 2.500 hands. After 6.000 hands I was up about $1.200 (after being up $1.500) and had to take a toilet break. I came back to the tables and completely lost the flow, I wasn’t winning a single pot for 30 minutes long and lost $1.100 in those 30minutes. I hardly ever tilt, but this really freaked my out, what the hell happened there and all I could think off was what could have happened if I didn’t take the break or took my “big” break as I normally do around 00:00. Since I was in such a good flow I decided to play an hour extra in stead of doing my big break and I was really steaming thinking about what would have happened otherwise. Well, as this can’t be good for your play, I closed all my tables and jumped on my couch to take a good long break. In stead of being up $1.500-1.200, I was now only up $106 but I should expect this to happen a lot more often this year. I did the right thing by quitting my tables, but still wasn’t amused at all. I got back in the game after a little more then an hour and the slaughter continued. Around 05:00 I pressed refresh in PokerTracker after not looking for a long time, down $1.100…. I was extremely unhappy, but calm in my head after my long break. I saw no reason to quit the tables yet and got really motivated to end this session good. I was doing okay winning some money back and suddenly won a $540 dollar pot where I didn’t even thought I would be the winner after seeing preflop/flop capped on a Q8xA board holding 88. 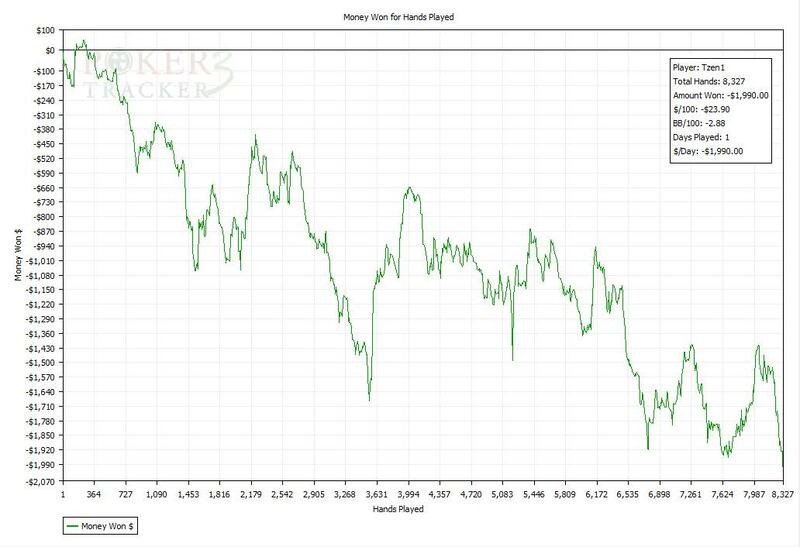 I won some other nice pots and after seeing that I was in the green again it was time to wrap up the session at 06:45. I had played another 13.500 hands, winning +$323,50 and gaining 11K VPPs. So tomorrow it’s back to work. I’ll bet that will feel a bit strange as I would rather keep grinding, but I also like the change. I think it also might help in keeping my sanity during the long grind ahead. I’m extremely happy with the start, but we are talking about 4 out of 365 days. I’m now making loads of VPPs, but I also expect days where the tables are slow and I have to play some $2/$4. I’m anxious to see what more will happen this year along the road. Nice start of the pace! What’s your planning of January? Are you trying to get ahead of the pace or you wil only grind the VPP’s you’ll need this month? GL with it, will folow your Twit and blog updates! I was planning to do 100K, but guess I’ll do more after the good start. I’m planning to start way ahead of pace as long as it’s cold outside. I live next to the beach, so hope I can spent a lot of time there during the summer like last year! Nice to read your updates, keep up the good grind! I believe you can easily make SNE with your current attitude and approach. A small piece of advise. DO NOT look at your results-in PT- while playing. and I have continued many bad seassons trying to break even. Obviously both dessisions were wrong. Play predefind -timewise- seassons which could only be shortened if you feel tired during your play or extended if you feel refreshed. I’ve tried not to look at PT for a couple of months back, but since I can’t look at showdowns while I’m playing, I use it a lot to look back at played hands at moments I have some spare seconds. This really helps me to get a better feeling of how the other playing is playing and I make adjustments in my play along the way. Thanks for the tip ofc!